A lot of people ask me about how to become more emotionally mature or stable or learn to like yourself for who you are. So I just came across some stuff which I hope helps! Let us look at the first circular chart I have attached below (the first picture with 3 circular sections made in a bigger circle). So, basically, most of the times we do not know what we are feeling. We just have a vague idea of the of the emotions we are feeling. 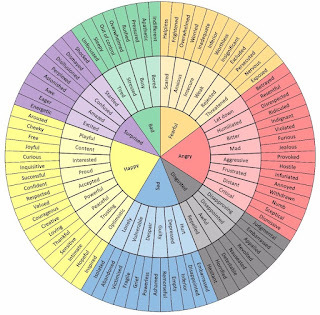 If you look at the circular chart I have attached from the article, these emotions are given in the main core of the chart - given by different colours. Once you have identified the emotions in the center, move to the ones in the next step (the ones in the same colour). And from this second step, move to the 3rd. 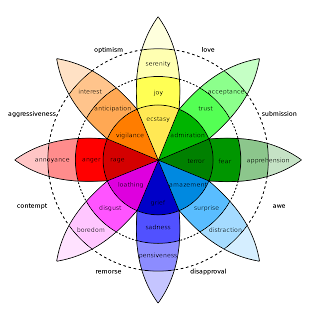 The final outer emotions are the exact feelings we have. 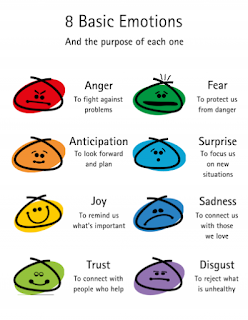 How do you reach the final outer emotions? Let us try an example. Suppose you know you are feeling bad. Once you know this, read the 2nd layer, emotions and try to connect. Are you bored or tired? You will most likely be able to differentiate and pick out what you are feeling. Now once you have the second layer emotion, think of the emotions in the third layer. This is where a whole lot of honesty with yourself will come in. Try to remember situations which started this feeling and you will realise what you are feeling and why you are feeling that way. And then you can start dealing with the feelings by taking actions and making decisions. You can chose to move on, talk about it to the other person, take some action, or change something about yourself. I have updated all the relevant videos of interviews, talks and other sessions that were done by me on my YouTube channel. Hope it helps! Frequently asked problems - common problems faced by all aspirants! Since I have gotten extremely busy with work I am unable to find time to respond to people individually and help out with their problems. Below are the questions that most aspirants ask me and my responses to them. I thought this way at least people will not be stuck with just the basic issues. Hope this helps. 1. How to start the preparation? Where to start, when to start etc. Ans - The first step is to check out the syllabus properly. Read the notification properly and a repeat a few times. Do it yourself and do not go with what others say. Decide how much and what you have to study for each topic. You can use the internet for this research. I have mentioned all the books I studied for each topic and a lot of other people have also done the same. Check those lists out. See what seems relevant. Start with NCERTs. And then move onto more specialized books. You can use internet to study each topic properly and in detail. Best of luck! 2. How do I make my time-table/plan my schedule? How did you study? How many hours should I study in a day? Ans - Just check out the syllabus properly. Decide how much and what you have to study for each topic. Divide the course into subjects and then divide the subjects into small bits. The current syllabus is very topic wise. Decide the relevant books/material you will study for each topic. Then plan the number of days you will finish each topic in. Now divide the material for each topic into days, as in what will you finish on what day. Make daily targets of course and finish those! Make an easy schedule. Do not burden yourself too much. Also, keep a loose schedule so that if you are not able to finish any topic properly, then you have an extra day to run through it. Also keep enough time for revision. Best of luck! My answer on Quora for this - I would recommend that you fix daily targets of course that you would cover. For example, say that you will finish 10 chapters of Polity today. So then try and finish that. When making the plan check out all the topics/books/ reading material you have to cover. Then divide them into number of days. Say you have to cover History, Geography and International relations. And you have 15 days. So you decide how many days for each subject - 3 days IR, 6 days Geography and the rest History. Then you decide how much part of that subject on any particular day that you will finish. So say you are dividing history then say 2 days for modern India and 3 days for World and 1 day extension. Then divide that I will finish 15 chapters of Modern India book on first day. And then do that. Instead of making hour-wise time table, make a syllabus wise time-table. After all, what matters is finishing the course and not showing the examiner how many hours you study!! Do not worry about the hours. Focus on finishing the syllabus of the day , no matter it takes you 3 hours, 7 hours or 12 hours! When we make hourly time-table you tend to just waste time in staring at the same page and not really being productive. The point is to finish the course and not spend a certain number of hours looking at the book. Usually with hourly time-tables we waste a lot of time and not really manage to learn anything. At the end we say I spent so many hours studying but we don't really learn so many hour worth of the subject! It doesn't matter how many hours you spend studying as long as you finish the course and know it well. The target is to know the subject so focus on that. And the best part is when you make a course-based time-table you won't worry that you doing other activities in your free time and you can take a break whenever you want! You won't force yourself to keep studying even when your brain is not working because you said you would study that many hours! In this time-table you are free to study when you want and do all the other things in life! Like I would decide that I would take a break after 3 chapters so then I would quickly finish them and take my break and do something else. If you have a break in 2 hours, then you would worry about the break for 2 hours and not finish anything! Which is just a sheer waste of time! Also please remember to make a very spacious time-table so that you actually follow it and it doesn't become a burden. Often we make such a rigid schedule that we get tired just thinking about it! Do not try to do so much in one day that it becomes impossible for it to happen. And like someone else said, make sure to do all your other activities too! It is important to be a well-rounded person and enjoy your studies . If you cut yourself off then studies will become a burden! Good luck! 3a. At what age do I start the preparation? I am still in school and I want to be an officer, what should I start studying now? 3b. I am in my first/second year of Graduation. Should I start the prep? Q on quora - Is it good to prepare for a civil services examination during graduation? A- Well if you flunk out of your graduation, it won’t be of much use, right? Also, if you do badly in graduation and then by some stroke of chance, you don’t clear CSE, then where would you be? Finding a job would become very very tough in this case. So you can start prep as long as you can balance things and not lose out on your graduation. But be very clear on balancing! I am not saying you need to ace your grad exams but you need to do decently so you don’t mess up your future. I remember cases when I was in school, of students who prepared for IIT entrance, got through with great ranks, but failed class 12th so had to let go of their IIT seat and also have to give school exams the next year! So plan in such a way that you become employable after graduation in case you don't clear UPSC. Please do not be over confident and stupid and assume that you will definitely get through! There are no guarantees in life. Do not give life a chance to mess you up. Take the smart route and plan for every possibility. Hence make sure you can get a good job after graduation AND THEN START YOUR UPSC PREP. 3c. What graduation should I chose to become an IAS officer? Ans- It does not matter what is your graduation subject for IAS exam. But your graduation will matter if you have to become employable. A professional graduation is always a good idea. That way you have all the options open. If you clear UPSC, then great, else you can always go become a professional of whatever stream your graduation is in. But if you do not take a professional graduation, then you have closed a lot of your own options. In this case if you by chance do not make it through to government exams, then you will be stuck!! So make your base first. Get a good alternate career option and only then start thinking about UPSC. I did the same thing and I am very very glad I did so! Please remember, life does not always work out the way you want. So it is upto you to make smart choices. 3d. Should I do some other job first after graduation or directly prepare for UPSC? Ans - I personally feel it is better to first get some other job in hand. That helps in multiple ways. Firstly, it gives you confidence while preparing that you have something to fall back on. You have a ready alternate career in case things do not work out. Also you figure out that you are worth something and hence you feel better about your chances of getting through. Secondly, you get a financial source for all the books you have to buy for this exam. You do not have to depend on anyone else. And you do not curse the system and the government and the coaching centers and the rental house owners for the expense saying why are there no scholarships or free books or free accommodation etc. Thirdly, working makes you more refined and hence able to write better answers in exam. It definitely helps having a work ex in terms of the way you express yourself in the GS papers and the Interview. Please do not be in a hurry in life. You should build enough bases for yourself so that you are able to handle whatever life throw at you! 3e. I want to do Post-graduation and then start preparing for UPSC. But will it not be too late to give the exam? Ans - I myself started the prep after post graduation and 2 years of work-ex. I wanted to get a strong back-up in case things did not work out with UPSC. Also I wanted to bring my best to the job so I wanted to get some experience before I became responsible for so many lives. I think my country and its citizens deserve the best I have to give and so I wanted to make sure of that. And what does being too late mean? Why are you coming into this job? To make a difference and improve the world around you or something else? And if this is your aim, then how can it ever be too late to do that? How can being in your late 20s or even early 30s make you less capable of improving the lives around you? Please be clear in your motives. What exactly is your aim? If it is to serve your nation and to make a difference in the lives around you, then no age is late for it. 4. Can you recommend books for Hindi/non-English medium? Ans - I am sorry I don't know anything about Hindi Medium. Please check with students who have passed in Hindi. Best of luck. Q on Quora - What is the reason most successful students in upsc exam from English medium not Hindi medium exam? A- There are multiple dimensions to this issue. Firstly, there are statistically more people giving the paper in English that Hindi, so obviously more would clear with English. This is also due to the fact that most of the higher education in the country is in English, hence that is the language most people attempting this exam have studied in. Secondly, most of the good material available is in English (because the larger number of people are giving in English, so easier to print it in that) so that becomes a disadvantage for Hindi Medium students. Since most of the material currently is available online, and it is all in English, that is a further disadvantage. A lot of documents themselves come out just in English or it is too tough to find proper Hindi sources for them. Thirdly, we use a lot of English words in our colloquial Hindi, but we don’t vice-versa in English so finding proper Hindi words for technical terms is also tougher. Hence the language skills themselves become tougher in Hindi than in English. A lot of the scientific terms become much more complicated when translated to Hindi. All this leads to a lower number of people passing with Hindi. But this is the case with ALL REGIONAL LANGUAGES. So it is not just Hindi. It is all other than English languages. If we add the numbers of all students who cleared with all regional languages, this is actually not as bad. 5. How do I prepare notes from books/newspapers etc.? Is it necessary to make notes? Ans - Personally, I never prepared notes. I studied directly from the books every time. When you make notes, you only take the perspective you got when you studied it that time. But the next time you read it, you will get something new. Summaries and notes are not the best idea. You waste a lot of time writing down stuff and that stuff is never complete. It is just one perspective and only very restricted ideas. Books give you a new perspective every time. Instead of making notes, I, personally, underline the important points in the books itself. And I write in the margins anything that comes to my mind and seems important to me. If the space is less, I would write the thing on a separate sheet and put it in the place in the book itself. That way I had everything ready for the next reading. Since I read multiple books for the same topic, I did revise all the books again and again. And I tried to mention the points of one book in other books also sometimes, but that did not mean I did not read all of them again. Notes from newspapers make no sense to me. I instead rely on current affairs material available in a bunch in the market and read the news websites. You can cut out certain articles from the paper if you feel like you need to read them again. But wasting 2-3 hours making notes from newspapers is just wastage of time and energy. Read the paper 2 times instead of doing that. Also all relevant news is repeated over 3-4 days so if you read the paper 2-3 times for 3-4 days, you really won't need the notes! 6. How do I choose an Optional Paper for the exam? Ans - In choosing an optional the only rule is to take the subject you can love the most. You have to study it again and again ...almost do a PhD in it. So the only thing that matters is that you can study it that much! People clear with every subject. And fail with every subject. No subject has a 100% record. What matters is that you can handle the subject. So take the one that interests you the most. You have to pass that subject means, you need to be good at it! Not what everyone else is good at! How can you be good at something that other people like? Or that they are good at? Please understand that you are an individual yourself and that you have your own brain. You can only perform well in a subject if you like it. Because you need to be able to think in it and generate new ideas. So take a subject that interests you and not what other people have done well in. Ans on Quora - You have to study that subject again and again and have to do a very in-depth coverage of all its topics! So it should be a subject that you enjoy studying. If you don’t enjoy it then you won’t be able to do justice to it and hence not perform your best. Every year people clear with all sorts of subjects, so it is not right to say any particular subject gives best results! The subject which gives best result is which was loved most by the people studying it! So choose what seems most easily readable to you and go with that! 7. Is coaching necessary? Can I do it without coaching? Ans - Coaching is not necessary. Most of what you have to prepare is from the internet and from books. Coachings are just about helping you make a routine. Also if you are completely unable to understand where to start and where to go, then they help in giving you a primary direction. If they were necessary, then only people who went to coaching would clear the exam and all the students of coachings would pass. That is not the case. Only those students pass who have prepared well on their own. Sometimes it does not matter if you took coaching or not. Coaching can be of help to some and not to others. It is very individual and about how much of a background you have and how much help you need. It is NOT necessary. Do not take coaching just because others are doing it! Something that suits me will not suit you and vice versa. To pass this exam, you need to learn to think for yourself. What sort of officer do you think you will make if you just do everything that other people do? You are not the same as others so don't make choices based on them. If you need hand-holding and daily help, then take it otherwise don't! Q on Quora - What should I do if I have 10 months for IAS preparation? Should I join a coaching centre or self preparation? A- Depends on how confident you feel about preparing yourself. Self-prep is possible as everything, not covered by the books, is available online these days and you can get coaching material for the rest of the stuff. And even after joining, it will be your self-prep that will decide whether you clear or not. But if you are not disciplined, have no idea what any of the topics of the course actually signify, feel under-confident and need someone to hold your hand and give you the initial push, then you can join the coaching. 10 months is more than enough for both. 8. Which are the best coachings in Delhi/Elsewhere? Ans - I am sorry I don't know anything about coaching institutes. Please check on online forums regarding this. 9. I got low marks in test series and now I am extremely nervous and can't concentrate. What do I do? Ans - It is ok. Everyone gets nervous. That is natural. Don't worry about getting wrong answers in tests. Just revise those topics more thoroughly. It is better to get wrong answers now than in the exam. And these tests don't matter. What matters is the final exam. Don't get demotivated. The point of giving the tests is to become better. If these tests are instead making you nervous then please do not give them! Personally, I have never given any practise tests. In fact, when I first joined coaching, I submitted an answer just as part of the class session. The examiner gave me very low marks and actually told me "Improve your English"!! And this was a person who could not speak one sentence correctly himself. So I realised the low quality of teachers who examine your tests and never submitted another answer for correction again nor gave any test. Most of the people who check your answers are aspirants themselves! So don't worry about getting low marks there! Forget what you scored there! Keep trying till the last moment. You never know what will happen! Good luck! 10. I get demotivated very fast. How I keep myself motivated? 10b. Everyone around me tells me that I cannot do it and that I am nothing. Should I believe them? Ans - Everyone around you does not know you. They have not lived in your shoes, they do have the same capacity as you and they do not have the same drive as you. No one else can decide who you should be. Only you can do that. How can someone else tell you what to be? Only you can decide that! Do not let others define you. At the same time, do not be over confident and learn to let go. Sometimes some things may not be meant for you. In that case you should learn to move on. But do not get scared or leave something because of others. Other people have their own perspective. It cannot necessarily be correct. So go with what you think of you and aim accordingly. No one else on this planet knows you best. So no one else can define your goals better than you. 11. Please recommend some books for Prelims and for CSAT. Ans - I never prepared for Prelims. I directly only prepared for Mains. You can do the prelims course mostly by just that. You don't have to top prelims, just pass it. So if you do mains course properly, you can generally pass prelims. Marks matter only in Mains and not in prelims. These days Prelims has become very current affairs base so you must obviously do that but you cannot ignore the static portion. In fact it is best to finish your Mains prep once completely before Prelims exam. For CSAT exam, since I come from an MBA background, I didn't prepare at all. But the books that helped me during MBA entrances are Quantitative Aptitude by R.S. Agarwal. I believe he has also come out with a separate book on Logical Reasoning. You should also try to solve CAT exam papers and past year CSAT papers. Best of luck! 12. Can you tell me something about the interview? 13. Other people have told me this is how the exam is, but you are saying different. Who do I believe? Ans - You should stop listening to just anyone! Sometimes people just say stuff to pull you down. Also it is always a good idea to listen to people who have done something successfully themselves rather than those in the same boat as you. You need to learn to decipher the motives of things people are saying and try to find out the facts for yourself. Don't go around believing or disbelieving everyone! And in the end always do what feels right to you. 14. How do I improve my English? Ans - To improve your english, you should read English Novels, Newspapers and Magazines. Watch English News and English movies with Subtitles. Try having conversation in English with friends who know the language and ask them to correct you. Also practice English grammar from grammar books and websites. Best of luck. 15. Which novels or magazine is best for UPSC? Ans - I doubt there is any single novel which relates to UPSC Prep!!! Whatever gave you that idea? As for magazines, no single magazine is best. A multitude of them would make a better choice. I can’t personally recommend any, sorry. 16. Can you recommend books for optionals other than Geography? Ans - I am sorry, I never explored any other optional. I did take Public Administration in my first 2 attempts but that was very long ago and what I studied is not relevant anymore. Besides I didn't like it too much so I don't even remember the books for it. Hence, I cannot help with any other optionals at all! You should check with people who have cleared with the optional that you have taken and ask them for help instead. Good luck! 17. What strategy to study should I follow? How many times do I revise? Ans - There is no fixed strategy for this exam! What works for me will not work for you! Everyone is different. I may need to revise history more and you may instead need polity! So do not go by what others do! Make your own plan and targets. Also with revision, there is no rule. The aim is to know the course properly. So revise as much as it takes to do that. Some people need 1 revision, some people need 3 and some people need 10! It does not matter how much time it takes you. All that matters is that on the day of the exam, you have learnt what you needed. So don't ask other people to make your strategy. Make your own strategy. Check out past year question papers. See what sort of knowledge is needed and study accordingly. 18. How does one go about retaining the maximum from a bulky book, say, Lakshmikanth during the UPSC preparations? Ans - Multiple readings. That’s the only way unfortunately. And go back and keep referring to things if you forget them! Like if you are doing HC judges, then go back and see the differences with SC judges, etc.! SLA with Parliament and all! Gov with Pres and all! 19. Are NCERTs compulsory? Can I skip them? Ans - I feel NCERTs are the most important books. Even at my 4th attempt I still read them twice! Without NCERT you will never have the basics. Everything else comes after that. Also if you are too lazy to read NCERTs, then will you ever be able to read the rest of the course? NCERTs also are the only truly reliable source. Sometimes there would be conflicting knowledge in different books. At that time, whatever is written in NCERT is the most correct. Also they tell you what topics are important and what topics you need to learn in detail. A lot of the times, questions comes directly from NCERT. I recommend both old and new ones. Old for me is the ones before 2004/6 I think. 20. Does handwriting matter in the IAS exam? Ans - Handwriting would matter to the extent that the examiner must be able to at least read your answer!! If you write so terribly that all your words seem one, then you can’t expect them to give you marks can you? Think of attempting the paper from the point of view of the examiner….if you were given an answer-sheet to check….who would you give higher marks to? That is what I did in my final attempt…prior to that I used to write in a way that was convenient to me…but then I started writing in a way that would be easy to read for the examiner! Your aim is to get your point across, so as long as you can do that, how pretty your handwriting is, won’t matter (something I have personally done in previous attempts…specially in Pub Ad paper of 2011…beautiful handwriting but since I didn’t know enough about the question, just wrote the same idea in 15 different ways)! If there is no content and you keep beating about the bush then no matter how beautiful your hand-writing is, you won’t get marks. On the other hand, with brilliant content, an average legible hand should get you a good score. Best of luck! 21. Is it necessary to prepare every topic? I can't study some of the stuff. Ans - You can leave some minor topics but only leave them if you can prepare something else much better to compensate for it. Like I left a lot of culture but I made up for it in the rest of the portion of GS1. Leaving does affect your marks. I had lower marks in both the papers where I had left topics while preparation. 22. What is best way to crack the Civil Services Exam? Ans - I am sure it is not any special way! I think everyone studies the same way…treat it as any other school level exam and prepare! Do try to finish the course and find linkages in all you study. You need to have a comprehensive picture of the whole world around you (try to find logical inter-connections) and revise everything a few times! You don’t have to mug up anything for sure! If you want my booklist, I have given it on my blog. Also talked about how I tackled answer-writing. And hey! every book adds to your knowledge and personality! So pick up whatever you find interesting! Best of luck! 23. Is it possible to do a job and along with prepare for CSE(IAS Exam)? Ans - It is possible! People do it even with consulting jobs which are very very hectic! So it is definitely possible! You will need to be a lot more disciplined in your studies and work…and it might take you a little longer to finish the course since you are also doing other things but it can be done and will actually make for a good interview score! Best of luck! 24. How much time does it take to prepare for this exam? Ans - There is no rule. It all depends on your capacity and capability. Also the time available to you for studies. Some people take 6 months, some take 6 years and some never do it. So there is no rule. You will take time depending on your speed. Do not worry about it. Just start preparing. If you make a proper time-table then it can be done within a decent span of time. 25. How do I improve my writing skills? Ans - You can try to solve past year question papers. They will give you an idea of the sort of questions that are asked and how you can answer them. You can also join a test series if you need more regular practice with inputs from others. Another route is to form study groups of 3-6 people and study with them. You can all write answers and get them corrected by each other. Study groups also help keep you on track and share relevant knowledge and sources. Plus you can discuss issues and form opinions in your study groups. 26. I am not able to crack Civil Services even after 2 attempts. Am I a loser? Ans - How does clearing or not clearing UPSC make you a winner or a loser?? This is just one exam for a particular type of job! So what if you didn't clear this?? Is everyone on earth who is anyone doing UPSC based jobs?? What about Sachin Tendulkar, Aishwarya Rai, Bill Gates, Narendra Modi, Mary Kom? Have they all cleared UPSC? This is such a wrong attitude!! Maybe you are meant to do something else with your life! How can everyone be destined for the same job? If you are really keen on it, then instead of getting depressed and blaming life, try to analyse what exactly it is that you are doing wrong. And be brutally honest with yourself. Don’t keep blaming external circumstances. Remember that you can only change yourself and not other things. So work on yourself and be honest. If you lie to yourself, you are only harming YOU. Telling your mom-dad or others that you prepared so well but the system was rigged, doesn’t really do anything in the long run. Find your mistakes, see what it is that others have done that you missed on, and do it! In case you are not too keen on it, then great! Go do something else! You may be much more successful in anything else than you might ever be as a civil servant anyway! Our country needs lots of doctors, teachers, entrepreneurs, engineers, scientists….not that many civil servants! This is not the only way to achieve something in life. This is just an exam for a job…you may actually be someone suited for something else entirely! That doesn’t make you a loser! How could it! Just because your path is something else, doesn’t put you higher or lower than others! That kind of thinking is just so so wrong! In my opinion, the point of life is to be the best you can and contribute to the world around you. There is no one way of doing it! You can be just as happy at something else and actually make a bigger difference and be happier! So stop associating this exam with more than it is! It is not the only way of life and not the only way to success! In fact, the exam is just about getting a particular type of job! Success will be defined by how you do it and not by getting or not getting this job! And you can be just as successful at anything else! So don’t get depressed! Think smart! Life is much beyond just this exam and success is a far more deeper a concept that can ever be encompassed by just one exam! If not this, then do something else! Success is all about being happy and making a difference! You can do it by many other ways! I do hope you clear this exam if that is truly the only way you think you can make a difference but if you can think of anything else, then I wish you all the success in that! 27. Is it ok to criticize government in your answers? I find myself criticizing a lot of things, so I am unable to stop myself from writing it. Ans - As long as your criticism is balanced and you point to actual flaws while offering solutions, it is ok to criticize. In fact a lot of questions actually ask you to criticize....so it is fine! But remember to be balanced and find actual flaws and not perceived flaws. Check actual data, facts and figures before deciding that it is flawed. Also compare the intent and execution. Do not criticise something without actually researching it in totality. What may seem as a failure to you, may actually be offering results in a different part of the country. So research well, be balanced, offer solutions and then go ahead and criticize! 28. Do I need to remember facts on things? I find it hard to memorize data. Ans - I never memorized any data points myself. I find it very hard to mug up stuff. And UPSC these days wants to check your analytical skills and not your memory power. I did not use and write any data at all, in any paper. Yes you should have a general idea of some of the important statistics like the gender ratio and literacy rate etc. but you don't really need to mug anything up. You just need to have an idea in order to present a good analysis. And you do not need to quote any data ANYWHERE. You just need to have an idea of things. 29. I have very low marks in 10th/12th/Graduation or I failed in 0th/12th/Graduation. Should I even try for UPSC? Ans - First of all your marks before this exam do not matter in this exam. This exam is about starting fresh and giving yourself another chance. All that matters is how much effort you are willing to put in now. No one will ask you how good you were in school before this exam! But of course if you fail, then you will waste time and not be able to give this exam when you should. Failing in exams is not something to be aimed at. It makes things more difficult but not impossible. Also failing will make you under-confident and affect your performance. But it does not make you ineligible for this exam. It only delays this. And just to be on the safe side, if you have any doubts about being able to clear this exam then try to get another back-up job/alternate career before you prepare for this exam and then prepare for this. That way you will be safe and also be able to try for your dream. 30. I get distracted too easily and cannot disconnect from people and other hobbies. How do I make myself study for long hours? Ans - Why do you consider other things in your life as distraction? No one can study continuously. And you would hate your studies if that is all you did! You should go out and have a life beside this study! Make time for hobbies and everything else! And specially for friends and family. Just make daily course targets and finish them and do all the other things when you are done with the course! It will keep you fresh and also make you a lot more interesting as a person! Going out and meeting people will increase your knowledge and experience of the world around you. And the job is mostly about the world around you! So how will you do it well in future if you have cut yourself off from the rest of the world! I did everything during my preparation time! As long as you keep your course on track, please make time for everything else as well! 31. Question sent by someone - "my spoken english..I know u will feel that I might be fool who keeps asking you about same topic but as you know spoken english is also very important in our society that it affects people 's self esteem..but ma'am my question is I m afraid to talk to people who r have better command on spoken english than me..n..so how do I get over that problem...after that I will nt ask u about it again..I know it seems very boring same topic"? I hope all this solves most of the doubts people may have. You can post questions below and if there are enough people who have similar doubts and I have not already answered the question and I can actually answer it, then I shall try to add the questions here and answer them. I have tried to post where which discuss answer-writing and essay and ethics etc and other related things. Hope it helps! I hope the videos posted there solve most of your queries. Best of luck for your prep! Hope you all achieve the success you desire! COACHING and My recommendation – I took coaching in my first attempt in 2009-10. I did not have idea about the preparation. I did not even know what the topics of the course meant! I had no friends or family who had ever done this. That time, in 2009-10 there was no material available online. I didn’t know even NCERT books are needed. I needed coaching mainly for my optional. I didn’t attend most of the G.S. classes but did attend the optional classes. I had to prepare most of the stuff on my own though they helped guide me on where to start. These days a lot of material is available online and a lot of guidance on where to begin is also present online so if I were preparing today, I would not join them. I don’t recommend or condemn them. It depends on the sort of person you are. Some of us need hand-holding and need someone else to keep them on track and some of us are self-motivated. So it all depends on how you think you can succeed best. Though if it is only about material, a lot of it is available online these days. Geography as taught by Mr. Shashank Atom was brilliant. The teacher helped you recognise patterns and build your understanding yourself. I never opened a single book for Paper 2 of geography as I had understood everything so clearly in his class. I just had to update myself on the trends from the Economic Survey and the Census. Even though he didn’t actually like me and even doubted I would ever get selected, I think he was a brilliant teacher because he made sure our fundamentals were built. General Studies and Geography as taught by Mr. Jojo Matthews was absolutely terrible. In my opinion, he was pretty much the worst teacher possible. Firstly, he just comes to class and starts narrating some data which you have to take down at the speed of light because he doesn’t feel like he should slow down and either try to explain anything or even give you enough time to properly put your pen to paper, so that you might be able to read the things you have written, sometime in future. After the first few attempts I gave up altogether. Another really nice thing he does, is insult the students when they ask questions. And not only does he insult you when you ask, right then and there, he continues doing it for the rest of the class and carries it to the next if he can remember you. He thinks he is being funny, the student who dared to ask feels he is being insulting, and I just found it all plain offensive and rude. A teacher should create a learning environment and no question is too stupid - something I think he missed when he decided to become a teacher. Also he has claimed credit for my success so I think this is where I should clarify a few things that happened. I had given the exam in 2010 & 2011 and scored a rank both times. I did not give in 2012 because I thought I needed to first solve my matter in court before attempting this again, if ever. Since nothing was happening, I decided to try doing it again with the completely overhauled pattern in 2013. I went to their South Delhi centre where I had taken the coaching and begged them to let me buy the material for the new pattern. I told them I’d pay whatever they were charging. I was told that Mr. Matthews had given strict instructions and that I should call and ask him. I called him 5 times and messaged him 3 times. I told him I was an old student and that I had cleared the exam before and I wanted to buy the material and was ready to pay full price. He told me to call later but he didn’t deign pick my calls later. He did NOT EVEN ONCE RESPOND TO MY MESSAGES AND AFTER THE FIRST TIME STOPPED TAKING MY CALLS. He didn’t care if I was a partially successful ex-student. Actually he doesn’t really care if you are his student, he needs money and as long as you are paying for the full class again, he will give you the material…not that he is polite and caring as a teacher should be even then! But then this time, as soon as the result came, he found time from his super busy life to call and congratulate me! I am suddenly important! I handled Case Studies basis what I had learnt in Business School so there isn't any one technique. Every question requires a different strategy. Some techniques you can google are - PESTEL, Stakeholder Analysis, Value Chain, SWOT and Pro-Con. I am terrible at Maps. I can do the world map perfectly but just can't do India Map. I have been known to draw Amarnath in China, exchange Kandla and Mundhra port and basically change the location of every city. I know the big features as they relate to India physical but the small towns and cities and rivers that get asked, I never know. They ask a lot from Current Affairs and since I do my Current Affairs differently, I always get a 0 in map. Though I think I knew some of it correctly this year. So I cannot help with the preparation of the Map.